Arisha is a teenage girl of 18 years. 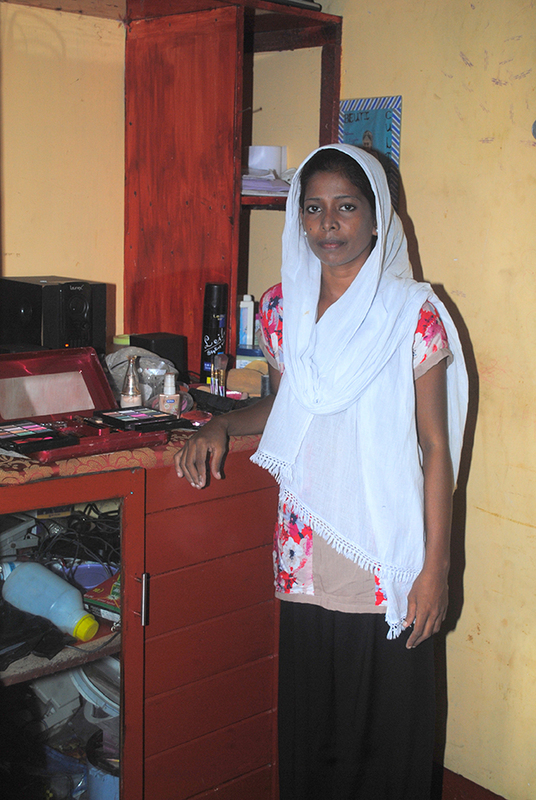 She belongs to a traditional Muslim family in Hikkaduwa. She has an elder sister and a younger sister and a brother. Her father who was the main breadwinner of the family became an invalid a few years ago due to ill health. The limited income of the family comes from her mother’s work as a cook and her sister’s work as a sales girl. After completing her O/L she stopped her studies since her parents did not have financial strength to support her for any further studies. She started thinking about her future, that what she wanted to do. To earn an income and to support the family she worked for a factory which sew children’s clothes. She began to learn sewing in the factory. Then she thought that I should do is what I like. Young Arisha did not know about the fact that the poor had no many choices. Her interest was in Beauty Culture. So she started looking for a good institute for Beauty Culture Training, but most of them charged high fee for training which was totally beyond her capacity. Finally she gave up her hopes but fortunately she came to know about Arthacharya’s skills training programmes from one of her friends and met Arthacharya’s Project Manager. “She guided me and told me about the courses. I was really very pleased to know about all the details and enrol myself for the beauty culture course. “I started from zero”. Day by day she learnt every detail about makeup, dressing, hair cutting, and flower arrangements. She was really impressed about their teacher as well. “I learnt everything whole heartedly. I have completed the Beauty culture course and am so very satisfied about the training”. At the Arthacharya’s certificate awarding ceremony of the project her model who was a Muslim bride gained the third position of the competition. Now she earns 7000/= per month which is only a few months after the training. She is confident that she could increase her income to a much higher level in the future. Finally Arisha decided to open her own Beauty Parlour in the next month. 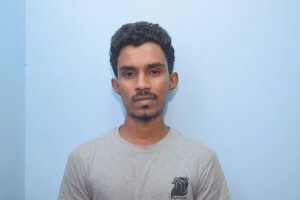 Emile is energetic young man who lives in Hettigoda , Hikkaduwa. He lives with his father, mother and two younger brothers. Emil belongs to a very poor family. His father is an electrician and mother stays at home. Due to poor economic condition Emile had his education only up to Advance Levels. He was looking for an opportunity where he could get some skills and a good job so that he could support his family. Since his childhood he used to like mobile phones and technology. When he stayed at home he used to watch YouTube videos from which he could learn about mobile phones and installing applications. One day Emil’s mother was informed about the skill training programme which was to be conducted by Arthacharya Foundation. Emil was insisted to enroll for the programme by his mother. Emile thought this would be the best chance to learn about mobile phones without paying a fee. In the beginning of the course he had no idea about the inside of the phone but eventually he learnt both mobile phone software, and hardware. “I got practical training as well as adequate theoretical knowledge”. At home Emile began to exercise the lessons that he learned at class . And soon he started to repair mobile phones of his friends and relatives. After the successful completion of the course he started to work in a electrical shop and then he joined ‘OPPO’ Mobile phone company. Currently Emile works in the sales department of this company. He earns Rs 25,000 per month. “The main reason that I got this job was I could beat my competitors at the interview. None of them had the technical training I received from Arthacharya project.” . ” Since I am working in the mobile phone sector I have to know every single component of the mobile phone whether it is software or hardware” . 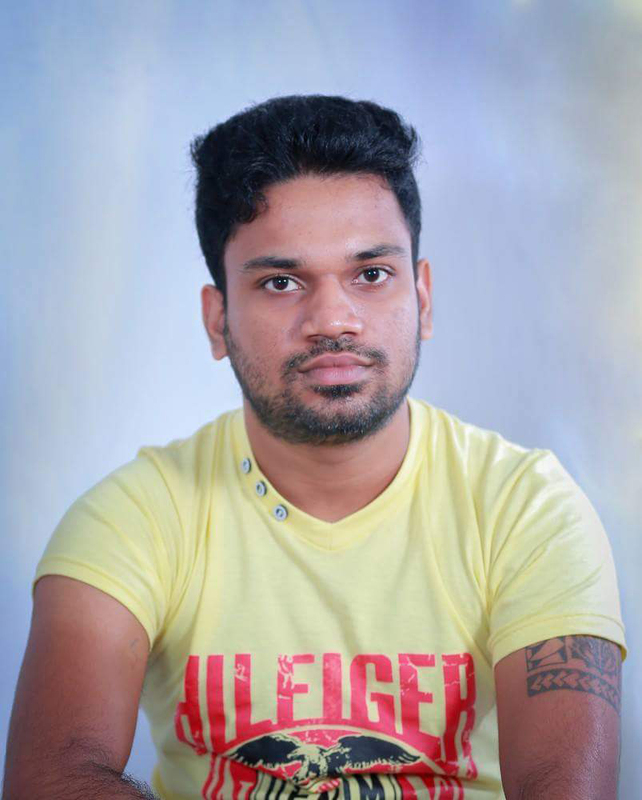 “I learnt everything from Arthacharya Mobile phone repairing course. In future Emile wants to open up mobile phone repairing centre. ” I am very happy and thankful to Arthacharya Foundation as my dream has comes true only because of their Program. By starting this course free of charge they are making it possible for those who can’t fulfill their dreams because of financial constraints”. Kaveesha Rashani, 22 year old young lady who is living with her mother, father and brother was unemployed before she joined the skills training of Arthacharya. She had passed Advance Level Examination and was confused about her future career. She wanted to take up a job which would make her independent and financially self-reliant. Having no choice she had to stay at home thinking about a job. . One day she was informed by her friend about Arthacharya Foundation and its courses that she could pursue. She thought of it as an opportunity to fulfil her dreams. Kavisha met the manager of the project without wasting anytime and became a trainee. “My family was more than merry and supported me throughout the course. As time passed, I realized that the course was changing my life in more ways than I could have expected”. The most important change was the confidence she gained. She was quite sure that she could make an independent living out of it. She completed her beauty culture training successfully. Her training reached its culmination when she won the first place at the bridal competition organised by AF which coincided with the certificate awarding ceremony. The project manager who had noticed her leadership talents recommended her to the manager of Arthavida who was looking for talented young leaders for field positions. She impressed the Arthavida management at the interview and got the job to work for Arthavida’s Balapitiya branch after she completed the training.. During weekends she earns an additional income by doing dressing and makeup. She charges 1000/= from a person for a makeup and a dressing.. Finally she embarked on her career in the sister organization of Arthacharya. “I got this golden opportunity hence I was a trainee of Arthacharya”“I experienced change in my personality, I came out of my shell and interacted more with people.” Arthacharya has given me wings to soar high. Born and brought up in the rural area of Hikkaduwa, Kalupe Chamika did not have an opportunity to even complete his secondary education. Chamika is a 17 year old teenager who quit his education after O/Ls since his family does not have proper means of survival. Financial disturbances always made his life more difficult. His father is a daily paid carpenter and mother is a house wife. After completing his secondary education he had to stay at home since he was not given any job because of his young age. One day Arthacharya Foundation’s Manager visited Chamika’s home and informed about the skills training programmes. It was Chamika’s mother who encouraged her son to become a trainee of this programme. Later Chamika enrolled as a trainee of the domestic electrical installation skill training. 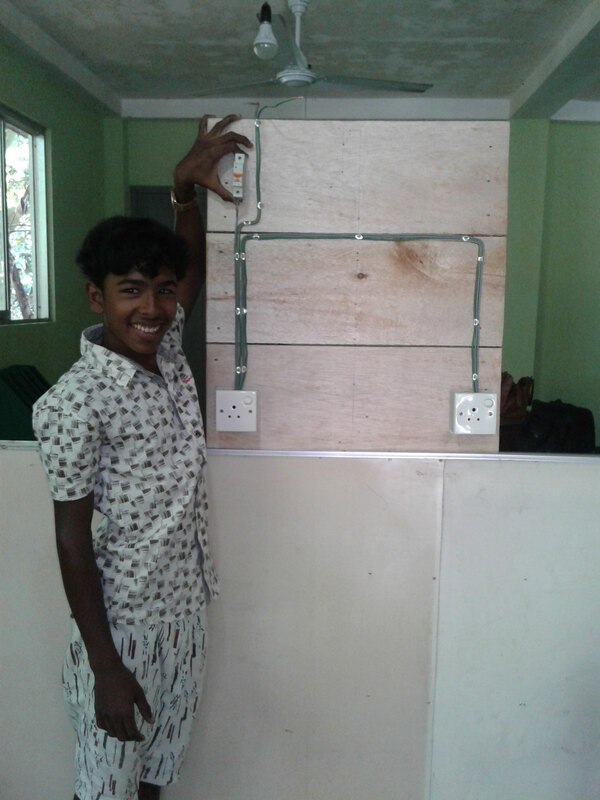 Before joining the house wiring skills training Chamika did not know even how to handle a basic electric work. But very soon Chamika became the best student in the class. Now Chamika does domestic wiring in his area. He already earns more than 5000/= per month. “ This skills training programme gave me sense of direction and awareness what I want to pursue the rest of my life”. He has been working with two others who are older than him. He is quite confident that he could become a master electrician who could have his own team of workers in a few years. 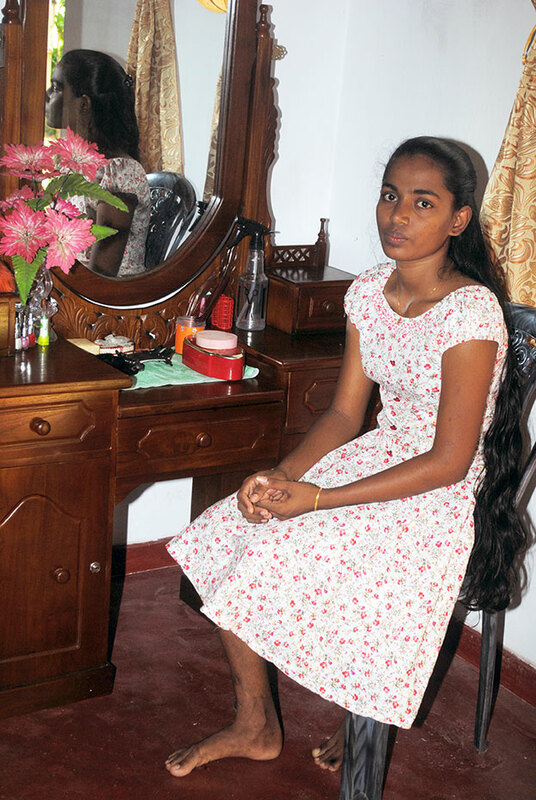 Pavithra is 20 years old young woman who is living with her father and mother. She stopped her studies after completing Advance Levels. Since her childhood she was very much interested about fashion and dressing. She wanted to follow a beauty culture course but it was not possible since her parents could not afford to pay the fee. Prasadi’s whole family depends on her father’s meagre income. Her father does masonary work as his livelihood. At a CBO meeting of Arthacharya, she came to know about all Arthacharya activities and its vocational courses. Then she took entered the beauty culture course which was her dream. She learnt the lessons very enthusiastically and she practiced those lessons by dressing and making up her sister. She started to work at home. Within a short period of time she had clients to do hair dressing, saree draping etc. She started her own beauty parlour in her house where she provides Beauty and Hair Styling services, undertaking Bridal orders also. At present her parlour is in her house and the business is going on very well. Now with her monthly income over Rs. 8,000 she is able to support her family. She is very grateful and thankful to Arthacharya for all the help, support and encouragement she had from Arthacharya. Imesha is 22 year old young lady who lives in Werellana, Hikkaduwa. She quit her education after completing O/Ls. She got married at the age of eighteen. Early marriages are quite normal among the poor. She had a very low self esteem, felt helpless and insecure owing to her negligible levels of education. Her husband is a house painter who earns about Rs 8000 per month that is not sufficient earning for a sole breadwinner of a family. After the marriage Imesha went to a factory where they made handbags. She got Rs 225/= per day. Later her husband did not allow her to go to work. She was informed about the skills training programme of Arthacharya Foundation by the Werellana CBO of Arthavida Intermediary. Later she joined for the sewing course and soon after that she joined the Werellana CBO. 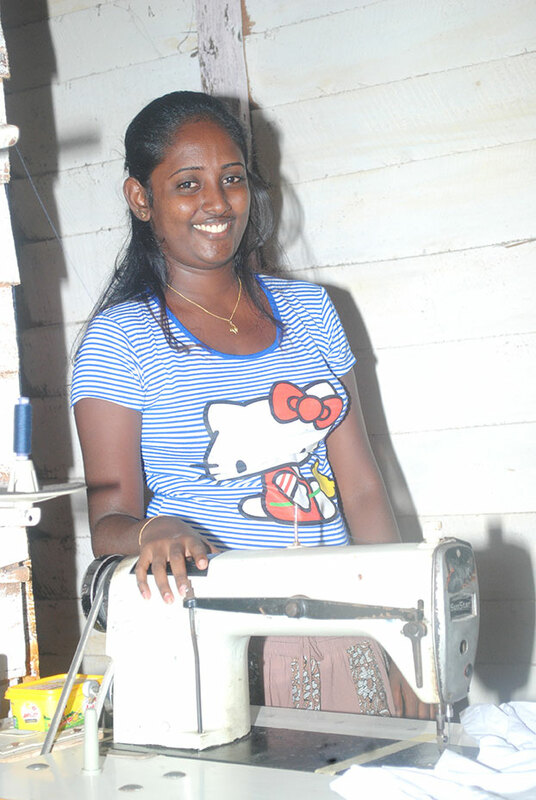 After completing one month in the course Imesha applied for a 15, 000 loan to buy a sewing machine. While doing the course she used to sew when she was at home. ” I knew nothing of sewing before joining the course. 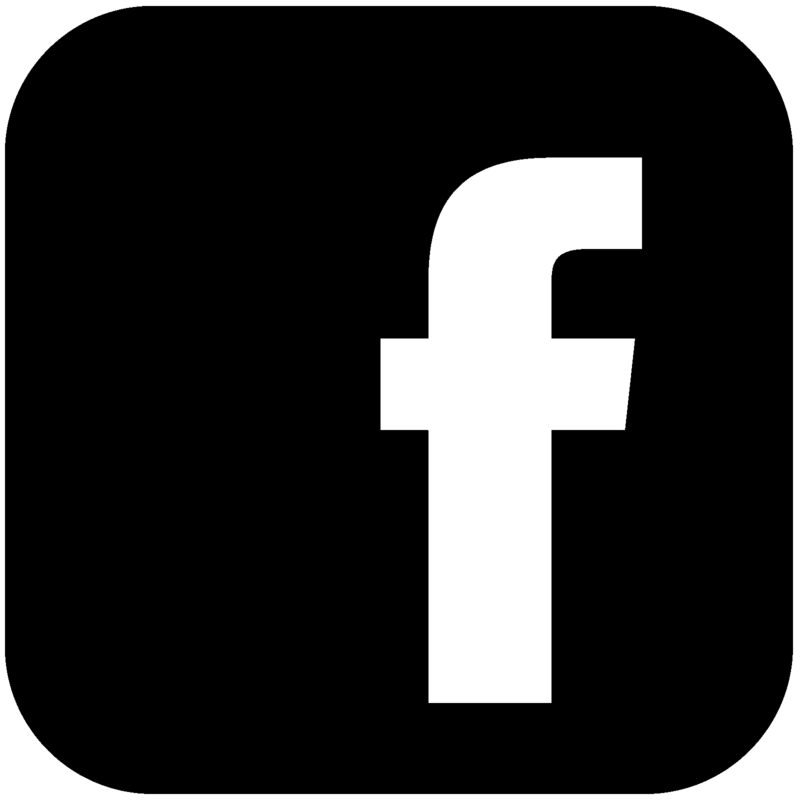 I used to do cutting and labeling bags when i was in the factory”. “I did not know even how to measure. During the training she was taught right from the basics of how to take measurements, inch by inch. 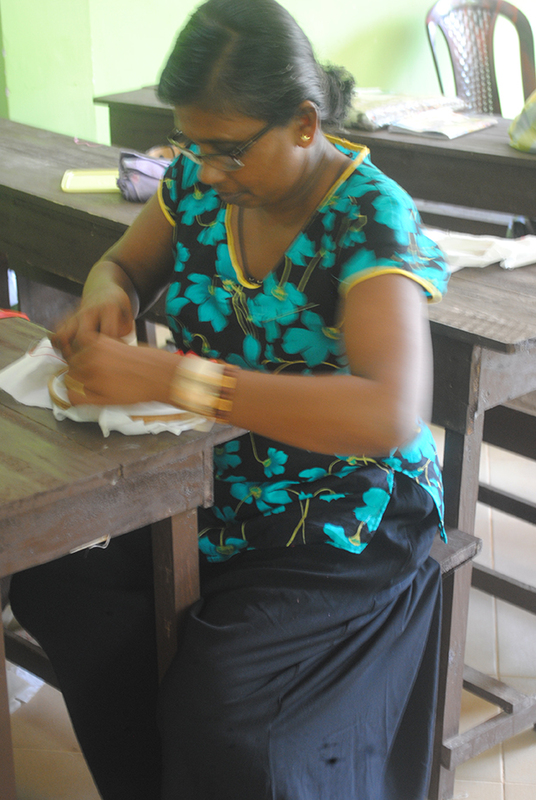 Soon after completing her course, she started to stitch clothes at home. Now she earns 6000/= per month. ” Earlier I sew only school uniforms and children’s clothes but now I sew table clothes, door curtains and different frock patterns”. 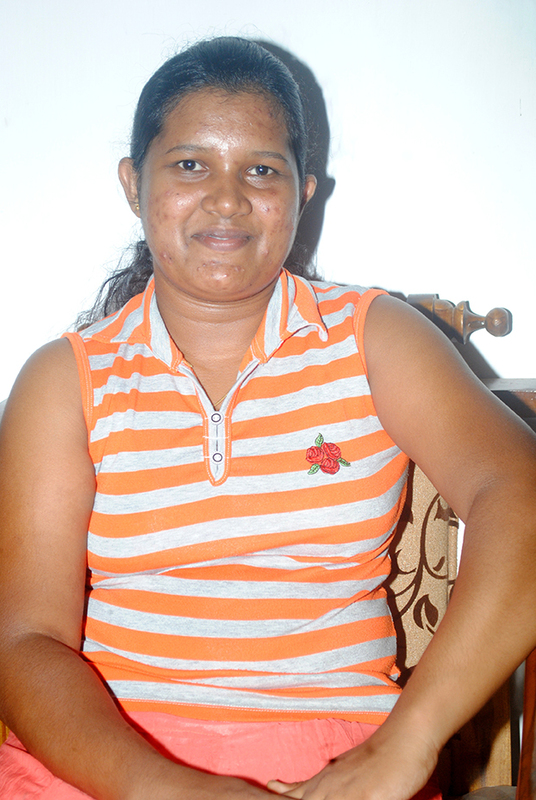 Takshala is a 33 years old dynamic lady who has three children. Since her marriage she has been living with her in laws without any gainful employment. Twelve years of average schooling that she had was not enough for her to find any decent job. She had got married at an early age and was not in a position to financially support the family. . Her husband is a daily wage labourer. The whole family has to depend on her husband’s work as a labour hand. One day the chairperson of an Arthavida CBO in Hikkaduwa told her about a skills training programme to be conducted by Arthacharya Foundation. On the same day she contacted the manager of Arthacharya Foundation’s project and enrolled in the beauty culture and hair dressing programme. 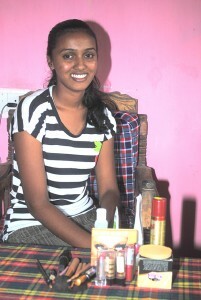 Thaksala says “I learnt everything that is necessary for me to build up an independent livelihood from the training ”. She learnt about hair dressing, makeup and saree draping. 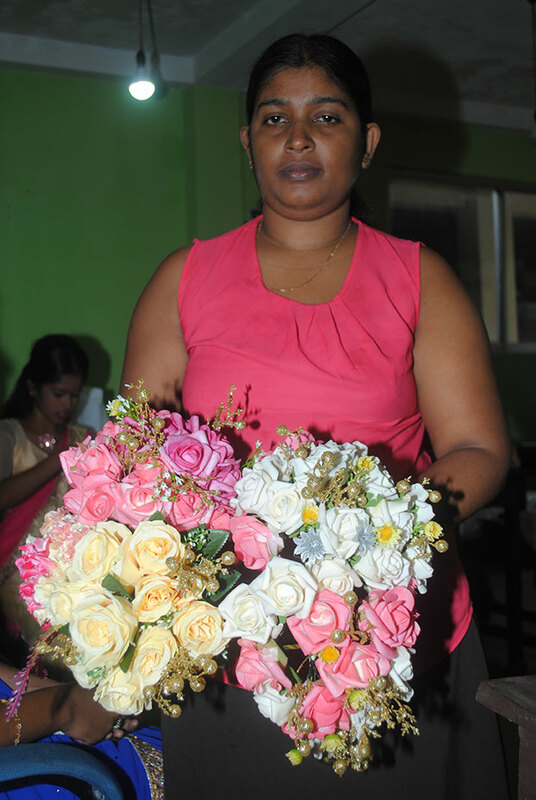 “Now I can make others beautiful” and “I earn a sizeable income”. 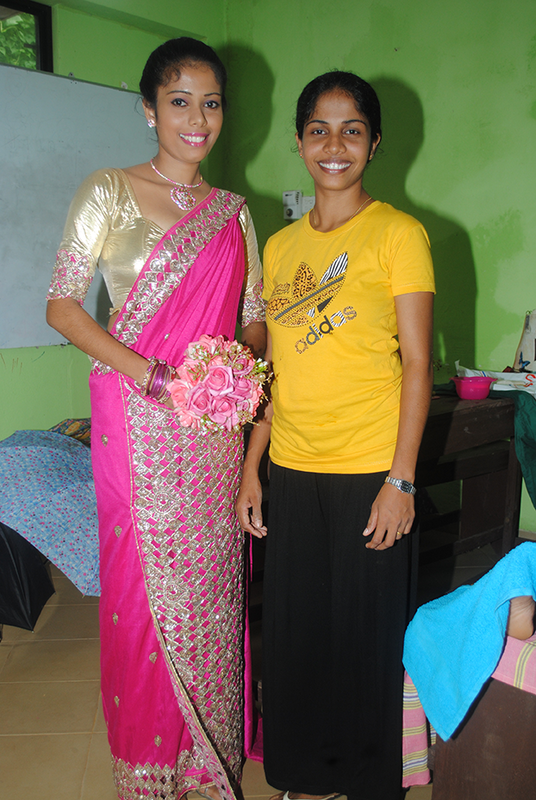 While still following the course she used to do makeup, dressing, and flower arrangement for her clients. She charged RS 600/= for a makeup and a dressing. Now she earns more than 5000/= for a month only a few months after completing her training. Today she is able to support the family with her own income which in turn has changed her position in the family to a more respectable level. She believes that very soon with some credit that she has already applied from Arthavida she would be able buy the necessary material to increase her income and would be even able save some money for their security. 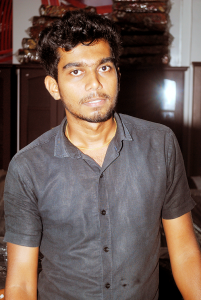 Buddhika is young man of 24. He is the youngest child in his family. Buddhika stopped his studies after A/Ls. After completing his Advance levels what he wanted was to follow a vocational training programme. Since he realised that mobile phone repairing would have good income potential that was the skill he wanted to learn. So he joined a programme offered by a private institution in Galle. . The training was offered at a high cost with low standards. He was not able to gain any acceptable level of knowledge on both theoretical and practical aspects of the skill from there. Finally he decided to stop attending the course since he found it to be useless and a waste of time. However, he did not drop his dream. Buddhika was lucky to join the Arthacharya Foundations’ mobile phone skills training programme which he came to know through his friend. After joining Arthacharya’s Mobile phone repairing course he understood that this was the best chance to start his career in the field of mobile phone repairing. The quality of the programme was even above his expectations. He completed the skill training programme successfully. While doing the training Buddhika was keen to repair mobile phones of his friends and relatives. Later he began to charge a reasonable fee from them. Following the completion of the course he opened a communication service centre with the money he borrowed from his family. 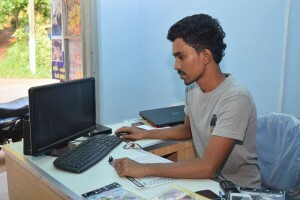 Now he manages his own business where he does mobile phone repairing, Mobile phone selling, computer repairing, and selling CD and Cassettes. 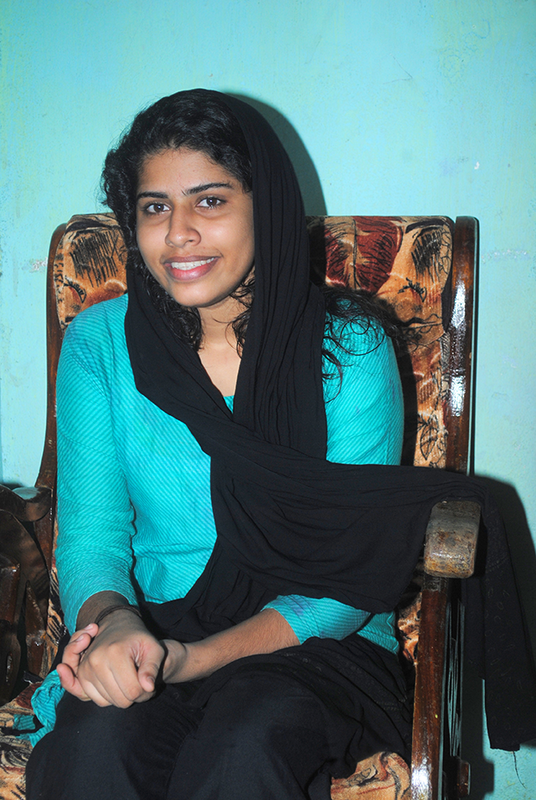 Supeksha Navodini is a young woman of 20 living with her mother and sister. After the tragic death of her father Supeksha’s family had to face many difficulties. Supeksha’s father committed suicide when she was 13 years. With no father figure to feed the family and protect them and surrounded by dire financial conditions, Supeksha was exposed to the crude side of life at a very early young stage. Having finished her A/Ls she was forced to give up studies due to financial difficulties. Supeksha was not able to take any tuition class like other children since she did not have money to pay for those classes. Her mother took all the challenges and responsibilities of the family. Supeksha’s mother made different handcraft materials at home and sold those to different buyers. But the income she made was hardly enough to support the educational and other need of her children. . Realising that her mother’s income was not sufficient to meet their basic needs young Supeksha decided to start a small business. She thought of growing Anthuriums which had a great demand in the hotels in Hikkduwa. 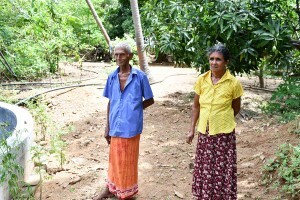 While growing Anthuriums in her small compound Supeksha joined the Arthavida’s Community Based Organization in Gonapeenuwala. After a few months she applied for a loan of Rs. 15,000 to purchase necessary inputs for her Anthuriums. Anthuriums were readily bought by the Hikkaduwa hotels. Following the successful completion of the loan repayment she applied for a second loan worth of Rs. 30,000 to buy pots. One day she was informed about the skills training programme of Arthacharya which is Arthavida’s parent organisation by the chairperson of her Gonapeenuwala CBO. She did not want to stick herself only to Anthurium growing but wanted to try her skills on beauty culture. Supeksha is a young talented go getter who would make the maximum out of what comes across her. She thought this would be another chance to acquire a skill as well as to earn much higher amount of money. Since the course is for free of charge she did not have to worry at all. She enrolled in the Beauty culture and hair dressing skill training. 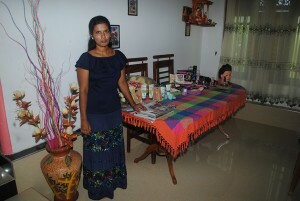 While doing the course she started to provide beauty culture service to her village women. 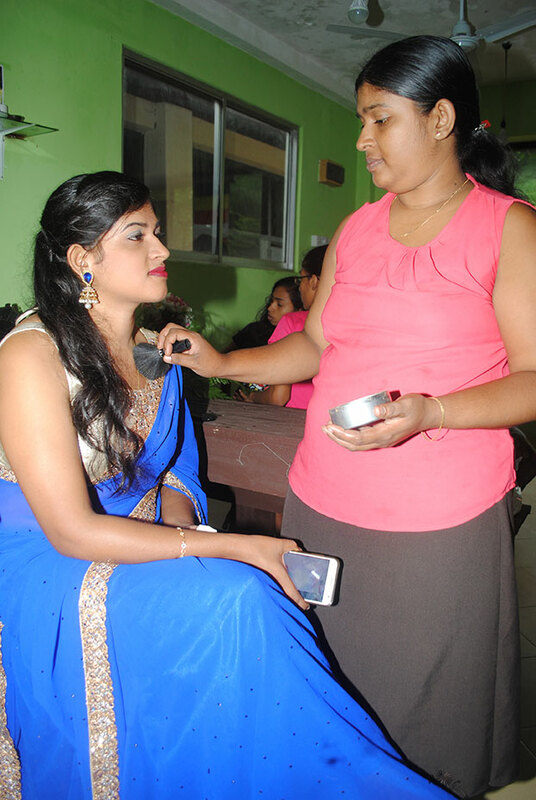 .Under the beauty culture training Supeksha learnt makeup methods, hairstyles, hair cutting, saree draping and bridal dressing. The first income she made was Rs. 500/= by doing a makeup and draping a saree. Now she earns around 10,000/= per month. She is planning to apply for a 50,000/= loan to buy material that she require for her work. “I always wanted to break the cycle of difficulties that was entagled in my life. Since I am poor girl who does not have father I was discriminated by many people. I have already broken the vicious cycle that we were living in. We can already manage our day to day affairs without a deficit. I know that I can increase my income much more in the future”. Anoja is 28 years young lady who lives in Seenigama, Hikkaduwa. She had a very low self esteem, felt helpless and insecure owing to her negligible levels of education. Anoja lives in her village with her husband and two sons. Her husband is an electrician who earns about Rs 8000 per month that isn’t sufficient earning for a sole breadwinner of a joint family. She went to a garment factory to earn an extra income for her family. One day she received an leaflet of Arthacharya, which described about skills training programmes. She thought this would be the best to join for the survival of her family. Anoja enrolled for the sewing training and mastered tailoring, cutting. Before joining the class she did not even know how to operate a sewing machine. She started to sew uniforms, skirts, fashionable frocks at home. She sews saree jackets for her clients. Now she earns 8000/= per month She stitches clothes at home to support her family with little additional income. Her husband and the family are supportive towards her efforts. She is keen to work and earn some money for a better future of her children. “I am more confident today, and can talk to people easily. I am more aware of what is happening around in society. I feel good that I am able to contribute to my family by earning a living” – says Anoja. Nayana is a young man of 20 living in Erewwala , Hikkaduwa. 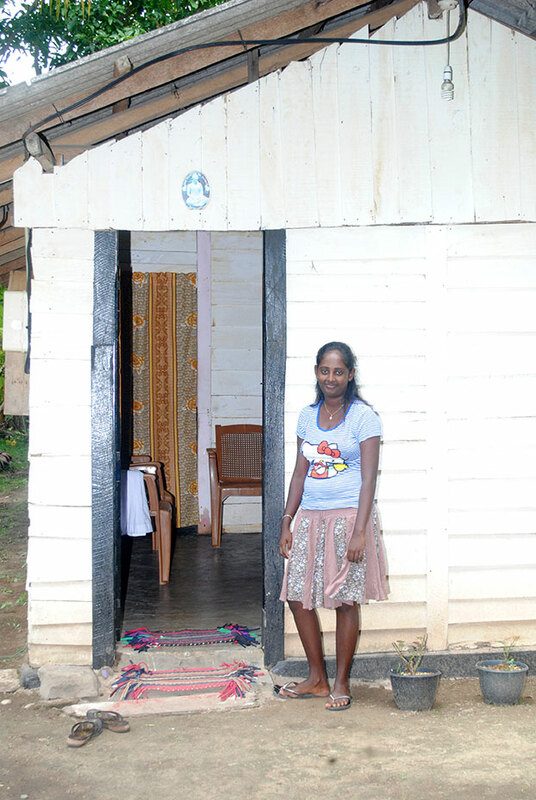 Born to poor family, Nayana was educated in the village school. But once he had finished that basic schooling, he had no work to do, nothing to look forward to. Nayana’s father is a carpenter and mother is a house wife. He has two younger brothers. Nayana loves to do electrical work. He wants to become an electrical mechanic one day. He was not able meet his due to financial limitations of the family. 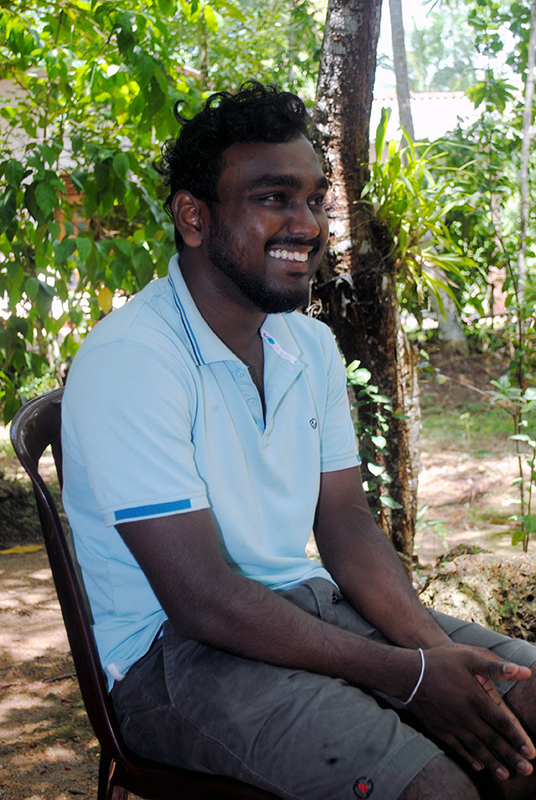 Nayana had no choice but to stay at home until he found a job. He knew there was no future without some kind of education on electrical mechanics. 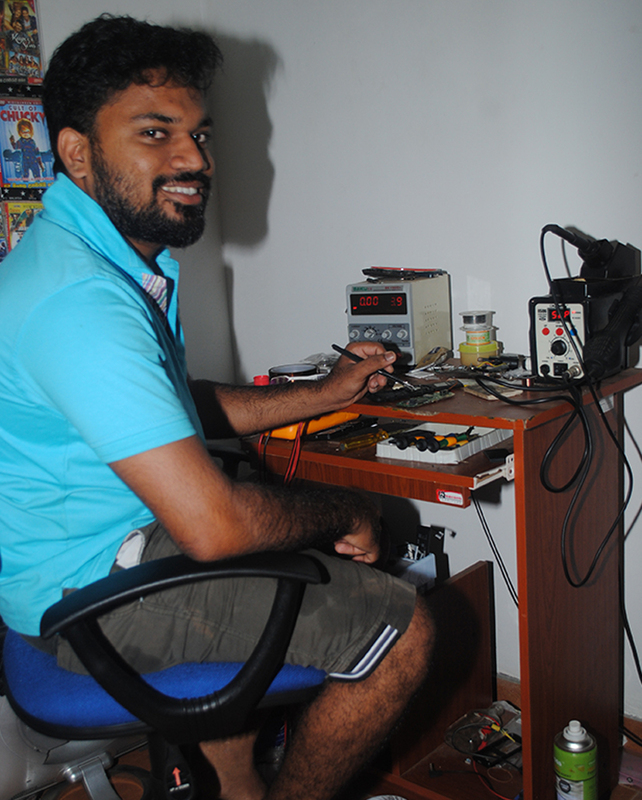 He learnt basic electrical on his own, by buying a few books and studying them at home. His mother learned from her Arthavida group about a skill training programme that would be conducted by Arthacharya for free. Nayana met the manager of Arthacharya and collected the required information. Without wasting any time he got enrolled in the domestic electrical installation skill training g programme. He learnt all the basics that was required to undertake wiring of a house building including switch circuit, electrical power, electrical current, cables and domestic electrical installation etc. While doing the course Nayana did electrical work in neighbour houses for free. Later he charged a fee for his service. He has already done some work for a few shops in the area too. He earns 15,000 per month. “Now I am living very happily with my parents. I expense my money for my family”. Nayana says, ‘My life has changed completely after coming to Arthacharya, economically, financially, and for me as a person and how I am today”. Nujuba is a perfect combination of hardwork, will, determination, and a dream coming true. When she was a child she used to collect fashion designs, articles and used to watch bridal, dressing and makeup videos. She replicated these by doing small hair styles and makeup for her neighbors. Fascinated by aspects of personal grooming she wanted to follow a beauty culture training but her meager financial conditions were a constraint on her aspirations. This was further constrained by the fact that Nujuba was married at the age of sixteen and had children. Her eldest is 13 years old. . Her husband three wheel driver who works for the owner of the vehicle. The limited income of the husband was not sufficient to meet the expenses of the family. To make ends meet Nujuba had to engage in some livelihood activity at home. While staying at home Nujuba sew clothes for her neighbours. She earned a decent income which helped her to manage her household expenses. However, unexpectedly she had to stop herself employment since she lost everything including their house to Tsunami They had no choice but to shift to a rented place where there was a beauty salon in the neighbourhood. Noticing this she was curious to learn what was really going on in that place. She observed all the activities that were happening every day. She thought that this would be the ideal thing for her to learn but had no money to follow such an expensive course conducted by private individuals. Fortunately, they were given a small apartment house by the divisional secretary’s office which had some support from foreign donors. She became a member of Arthavida CBO in that area. After that she applied for a 20,000 loan to continue her employment again. With income of her sewing business she collected some money and paid for a part time beauty culture course conducted by an individual. But knowledge that she had was very limited and did not even get a certificate. Later with the support of his husband Nujuba followed another short beauty culture training which again was not enough to start a business on her own. . It was at that point she came across the Arthacharya beauty culture course in Hikkaduwa. She joined this programme without any delay. . “All the private courses that I had come across were very expensive, I could not afford the same, but Arthacharya beauty culture course was free and high quality”. She had never had any technical training or any formal qualifications. Having got married at 16 she did not even have an OL certificate. She is thrilled to say that ” This is first certificate I got in my life”. Recently she applied for the second loan of 35,000 from Arthavida to buy necessary material and equipment to start a salon at her home. Even at the beginning of the course she earned nearly 6,000 Now it has gone up to 15,000/=. “I earn well. I manage a minimum of Rs.15,000 a month, and if I get good bridal orders, I will manage to earn about Rs 30,000″says a proud Nujuba. Wasantha is an extraordinary woman of 40 who works really hard to support her family. She lives in Kalupe, Hikkaduwa. She has two children and husband is a fisherman who works for a boat owner. 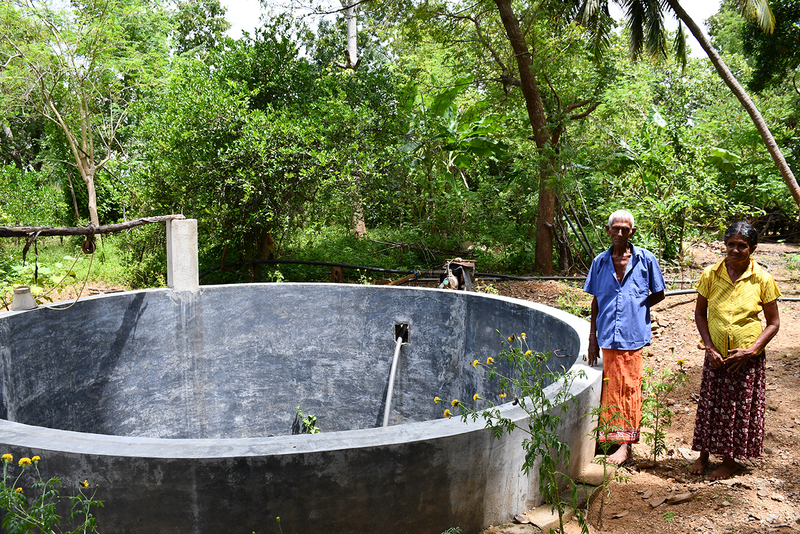 Wasantha’s family is faced with severe financial difficulties since the husband’s income is not sufficient to manage the family economy. . Her solution to their problem was to start some tailoring work at home. But she did not have proper equipment for that. Her solution to this was to join Thotagama Arthavida Community Based Organization. The very purpose of becoming a member of this group was to obtain a loan to buy necessary equipment for sewing. She was able to earn a small income by selling clothes, baby items and uniform for her customers. The limited training she had barred her from making a sufficient income. started to make shoes and handbags. She charged 400/= for a pair of shoes. She applied for the second loan as 25,000/=. She invested the money to make shoes and handbags. “The skills I received are assisting me to relive my family. With the money I make in my workshop I am able to buy things for my home, as well as purchase more materials to expand my workshop. I hope the market for shoes and bags improves so that I can continue to make more profit. I am already making more than 15,000 a month. Tourists like my ethnic bags”. She wants to continue working with this business and then open up a designer boutique in the future. Asith Madushanka, 22, is the eldest son of the family. This position as usual forced him to take more responsibilities than his siblings. . He was expected to earn an extra income to support his family. After completing his Advanced levels he wanted to follow a good vocational training course but it was not possible since his father did not have money to pay for it. Once he had finished the basic schooling, he had no work to do, nothing to look forward to. But he did not know that change was around the corner. One day he saw a leaflet giving information about Arthacharya Foundation ‘s training programmes in a very simple language. What attracted him was the advertisement for the mobile phone repairing course. Immediately he noticed that the course was for free. With the instructions of his father he joined the training programme. He successfully completed the mobile phone repairing course. While doing the training he started to repair mobile phones and installed software application at home. Asith was then assisted by the family with some money borrowed from a relation to open up a mobile phone repairing centre for needy clients. When he worked from home and earned up to Rs. 10,000 a month. Now he earns 30,000 per month. Asith is now a budding young entrepreneur with courage and hard work. He is now able to support his family. He is able to contribute to the family’s income and has become an expert in mobile phone repairing. Chithrangani is a self-motivated lady of 33. She is a house wife. At present her parlor is operating very well and she is able to support her family. She is very grateful and thankful to Arthacharya for all the help, support and encouragement. B.M Kusumawathee is a dynamic lady who is living in Wellawaya with her family. She joined Arthavida Intermediary CBO just four years back. First, she took 10,000 loan for vegetable cultivation. She repaid the loan successfully. Then she applied for 20,000 loan to uplift her vegetable cultivation and to buy new crops. then she took 30,000, 50,000 and 75,000 to increase the production of her cultivation. in 2016 she took 150,000 loan in the peer to peer programme to construct an agro well. She was able to construct her agro well victoriously. He agro well was built into proper technical guidelines. Now she is not scared of any droughts she can have access to water at any time. She is truly a victorious woman.